ADDRESSING the legacy of conflict in the north will form the theme of this year’s Four Corners festival with one of its founders saying he expects some people to struggle with some of the more challenging events that have been organised. 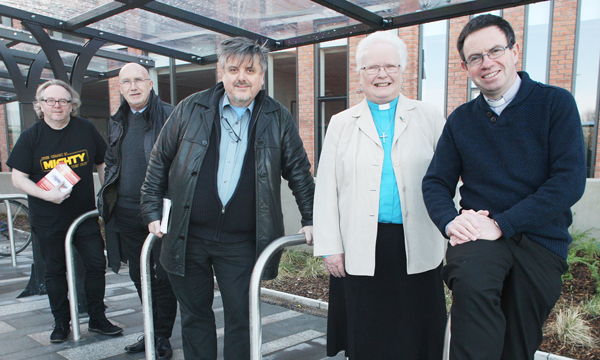 Fr Martin Magill established the festival in 2012 while Parish Priest of Sacred Heart Church along with Presbyterian minister Steve Stockman, with the aim of fostering relationships between local faiths. Now relocated to Ballyclare, the priest said that it was important that North Belfast was included in the programme given the level of suffering experienced by its residents. Pointing to the ‘Wonderful Wander’ event on Saturday, Feburary 4, Fr Magill said those attending would find it challenging. Another event organised for North Belfast will see four Troubles victims speak about their experience of grief and reconciliation. “The main event in North Belfast will be held in Holy Family church and we are currently trying to organise that. “Four people who have all been wounded in some way but have gone through a healing process will tell their stories. “Some will talk about the role faith played in this, but not all. The message will be about how we need to work through resentment. “We will hear from Paul Gallagher who was shot by the UVF, Joe McKeown, whose grandfather was shot dead by the British army, John Martin, whose father was shot dead by republicans, and Mary Moreland who is a UDR widow. In 2015 local artist Colin Davidson made the headlines after a portrait he painted of German Chancellor Angela Merkel was chosen for the front page of the influential Time magazine. For Four Corners he will be interviewed in front of a live audience by security journalist Brian Rowan in the Agape Centre on the Lisburn Road. He will discuss his Silent Testimony exhibition that saw portraits of 18 people affected by the Troubles displayed. The subject matter of the talk will be the need to create safe spaces for victims. Fr Magill said getting someone of the calibre of Colin Davidson to talk was a major coup for the festival.